ADSL broadband Internet services are available from Vantage Broadband in most populated places in Australia. The service can be added wherever a working plain old telephone line is already installed and our NBN Co has not yet started to deploy their network. For ADSL there is now a new problem emerging whether or not there are still ports available in your location. For all of these services are bound to be replaced with NBN-FTTP, NBN-VDSL or NBN-HFC and no new ports will be added anymore. In some areas there is already a shortage of free ports. Send us your correct address and we will check for the available options in your neighbourhood. If you hire an ADSL connection from Vantage Broadband, we will upgrade you at no extra costs to an NBN broadband connection whenever that becomes available on your address. 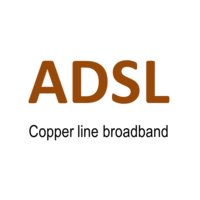 For self-installation of ADSL on a readily available and operational copper telephone line there are no connection fees, no minimum contract terms and no exit fees. One broadband bill for you to pay monthly in advance. For new copper lines or for alterations/repairs to existing home telephone cabling there may be additional fees and monthly line rentals. Ask us for a quote for your precise connection address.